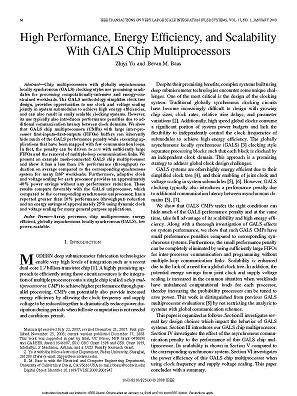 Chip multiprocessors with globally asynchronous locally synchronous (GALS) clocking styles are promising candidates for processing computationally-intensive and energy-constrained workloads. The GALS methodology simplifies clock tree design, provides opportunities to use clock and voltage scaling jointly in system submodules to achieve high energy efficiency, and can also result in easily scalable clocking systems. However, its use typically also introduces performance penalties due to additional communication latency between clock domains. We show that GALS chip multiprocessors (CMPs) with large inter-processor firts-inputs-first-outputs (FIFOs) buffers can inherently hide much of the GALS performance penalty while executing applications that have been mapped with few communication loops. In fact, the penalty can be driven to zero with sufficiently large FIFOs and the removal of multiple-loop communication links. We present an example mesh-connected GALS chip multiprocessor and show it has a less than 1% performance (throughput) reduction on average compared to the corresponding synchronous system for many DSP workloads. Furthermore, adaptive clock and voltage scaling for each processor provides an approximately 40% power saving without any performance reduction. These results compare favorably with the GALS uniprocessor, which compared to the corresponding synchronous uniprocessor, has a reported greater than 10% performance (throughput) reduction and an energy savings of approximately 25% using dynamic clock and voltage scaling for many general purpose applications. Zhiyi Yu, Bevan M. Baas, "High Performance, Energy Efficiency, and Scalability with GALS Chip Multiprocessors," IEEE Transactions on Very Large Scale Integration Systems (TVLSI), vol. 17, no. 1, pp. 66-79, Jan. 2009.